With winter here for a few more months it is not uncommon for cabin fever to set in. Many of us use this time of year to head off to a warm riding destination to get out of the cold and kick-starting the spring season a little early. While the list of warm biking destinations is nearly endless, here are a few that can be extra fun. Read on to learn, where to go and how to get there. The first part of any trip is usually the least fun – planning! However, taking a little extra time to figure out what type of riding you want to do, what off the bike activities you want to enjoy and the type of accommodations that meets your needs will make the trip more enjoyabe. I’m not going to tell you how to pack, but I will recommend you bring more than you think you need for a warm riding destination trip. A rain shell, a long sleeve jersey and a pair of tights don’t take up much room in your bag and can totally save a day if you receive unseasonably cool weather while away. Additionally, I would recommend you prepare your bike. Research the trail/road conditions by calling a local bike shop to see if they recommend anything. As an example, in the southwest there is a plant called Puncturevine (or goatheads), that produces a very hard, very sharp seed. These seeds destroy the more delicate tires your topography may allow. So when I have traveled to Arizona in the spring, I changed my tires to the puncture resistant variety and saved hours of fixing flats. I know the idea of a warm riding destination trip can be exciting, but be sure not to bite off more than you can chew. Overdoing it on the first day can set a bad tone for the rest of the week, so concentrate on riding and relaxing. I like to set up two rides for the first day (typically a morning and afternoon ride). That way, if you feel great you can enjoy both, but if you can’t muster the second one it’s easy to skip it. By contrast, if you setup one long ride for the first day, you may get stuck half way out with an empty energy tank. I am lucky to have enjoyed many winter months in warmer places, Some of those listed below are favorites of mine, while still others are on my list of places to go. 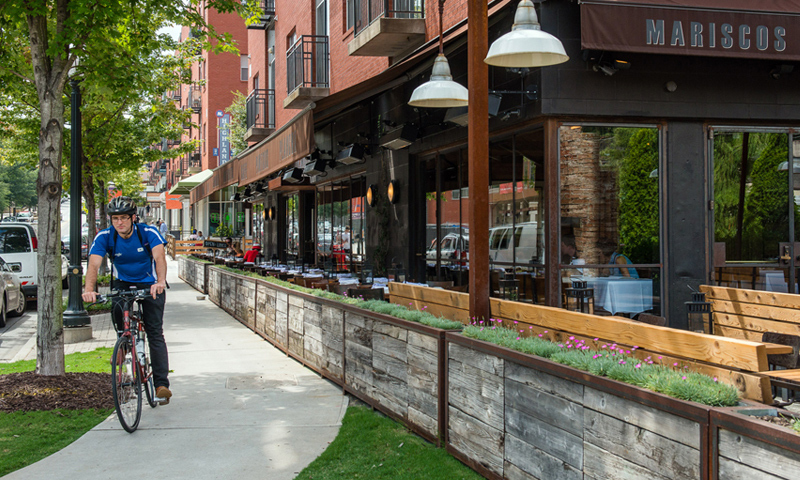 Georgia has become a cycling destination for riders of all discipines. It was the location of the first Olympic mountain bike race as well as the home of one of the united states most difficult stage races (tour of Georgia). If you have your heart set (and prepared) for a day of climbing hills and enjoying views, you can enjoy the Mile high 55 ride in the town of Roswell. If flat cruises, beautiful beaches and southern living are more your speed, check out the town of Savanah for it’s endless bike paths. Tennessee is home to great weather, awesome people, and spectacular riding. Places like Montgomery Bell State park just outside Nashville is a great jumping off point for mountain bike as well as road rides. It’s proximity to the musical city of Nashville also ensure your days in the saddle can be well balanced with nights of fun. Florida is a well known winter destination for all the resorts and beaches, but did you know they also boast world class mountain bike trails? Even in a city as spicy as Miami you can find dirt to satisfy you? Trails like the Oleta River State Park have tight singletrack with whoops, roots, and drops to make even the most seasoned rider shout with joy. Arizona is a winter haven for many thanks to its temperate climate. While it gets a bit hot for many in the summer, winter and fall are breathtaking. The roads outside most major cities are clear and some can be incredibly challenging. For instance, north of Tucson sits Mt Lemmon, a 6 hour ride that puts you more than 8000 feet above sea level. It is littered with wide open vistas and earth shattering views so bring your camera along! For cycling trips, it is difficult to beat the riding in California. The large state has green rolling hills in it’s northern territories as well as dry, desert roads that stretch on forever and let you work on that tan in it’s southern half. I personally love riding high above the golden gate bridge in the China Camp trail system in Marin county. While you are there, you can soak in some cycling culture at the Marin Museum of Bicycling and Mountain bike hall of fame. The Marin Museum of Bicycling is home to over 100 years of bicycle evolution. It is also a hangout for some of the most influential bicycle builders of ll time. Check out our HaveFunBiking National Guide for more place to ride for that #NextBikeAdventure. Traveling with your bike is not that difficult. If you plan to travel a lot, investing in a dedicated travel bike or buying a bike case are probably your best options. If that isn’t the way you want to go, many cities have stores that will rent good quality bikes at reasonable rates. There are a few things you want to make sure of before you go riding somewhere new. First is to let others know where you are going and when you plan to return. This can alert people to your absence if need be. Also, you may want to think about SAG support? AAA Auto Club now offers roadside bike assistance as a service where they will pick you up if you have a problem. Finally, bring your smartphone. You may want to turn the ringer off, so reality can’t spoil the fun, but it’s mapping functions can get you out of a jam if you take a wrong turn or need 911. So have fun and share your #NextBikeAdventure pictures and stories with us at HaveFunBiking.com on your next warm riding destination getaway. This entry was posted in News and tagged bicyce trips, bicycle travel, Bicycle trips, bike arizona, bike California, bike destinations, Bike Florida, bike Georgia, Bike rental tips, bike tenessee, Bike travel, Bike Trips, gike georgia, National bike guide, warm biking, warm riding, winter bike trips, Winter Biking on January 29, 2018 by John Brown. 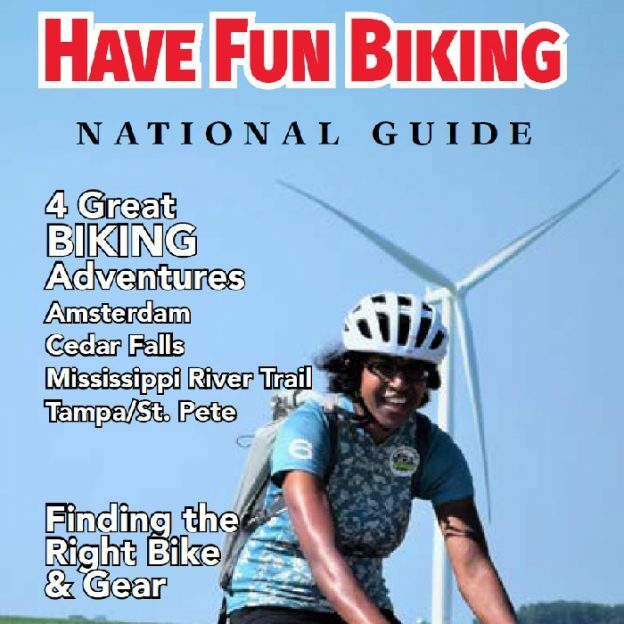 From all of us at HaveFunBiking.com (HFB), We are elateded to introduce you to our inaugural issue of the Have Fun Biking Guide. We began with the HFB website in 2006 and have been publishing bicycle guides ever since. stories, tips and reviews in this new digital publication. 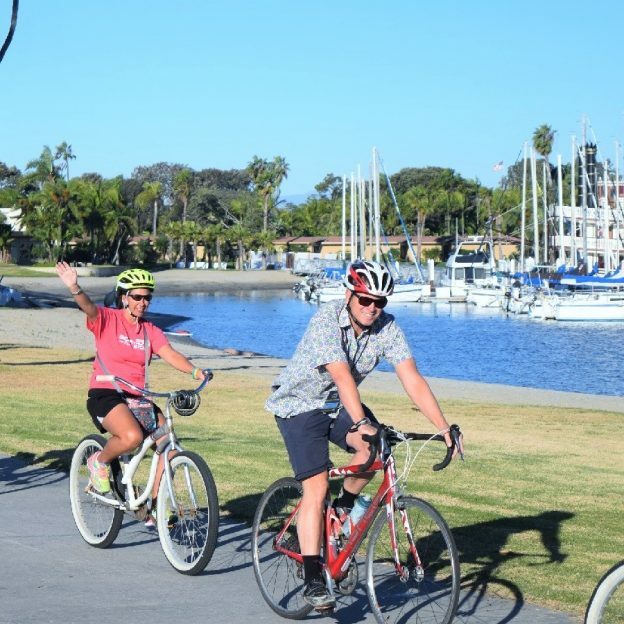 This new national bicycle guide offers bicyclists of all levels easily access the latest information on places to ride a bike, helpful tips and more. Many of the articles and tips you see in the guide are also on our blog at HFB. So if you are looking for more updated details, along with additional descriptive photos and links, we have you covered. Furthermore, if you want a sneak peek at what might be in our next issue of this guide or further details when on the go, please sign up for our weekly eNewsletter on the next page. I promise your email address will not be sold to, or shared with, a third party. Also, if you would like to view our daily photo ‘Pic of the Day’ please like – our Facebook or Instagram page. Whether you are new to bicycling or a seasoned cyclist, we hope you enjoy and bookmark this handy guide to your favorite electronic device. Our goal is to continue publishing biking information to help you stay active and healthy. This entry was posted in News and tagged AAA Auto Club, Bike accessories, bike blog, bike destinations, bike events, Bike Florida, bike Georgia, bike guide, bike Illinois, bike Indiana, Bike Iowa, bike Michigan, bike minnesota, bike Nebraska, bike North Dakota, bike Tennessee, bike tips, bike tourism, Bike Wisconsin, HaveFunBiking.com, National bike guide, RAGBRAI on December 15, 2017 by Russ Lowthian.